When considering what to do for your next night of self-care, you might be in the market for something that requires doing as little as possible—that is the point, after all, right? Cozying up with a fluffy robe and avocado face mask? Check. Spending a few blissful hours as someone paints your nails a pretty pink? Check. 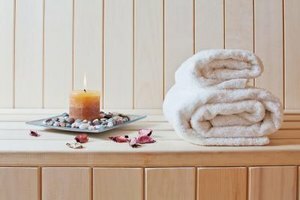 Spending time in a hot sauna where just the act of sitting in heat invites a whole host of health and relaxation benefits? Sign us up or...maybe not? Continue reading to learn just how long is too much time spent in a sauna. Faster recovery time after a hard workout: Finished a hard workout and can't bear to squat down on the toilet from the pain? Been there. Luckily, a sauna sesh can help. Along with increasing circulation, it can reduce delayed onset muscle soreness, or DOMS, which is pain that kicks in six to eight hours after exercise and peaks at 48 hours. Body detox: Sitting in a sauna with the intense heat causes your body to sweat—a lot. In this case, this is a really good thing, as sweating helps your body release toxins. Get a regular detox by going a few times a week. Better relaxation: Looking for some R & R? Sitting in a sauna can be the ultimate form of self-care. "They are warm, quiet, enclosed, and make you feel safe and relaxed in the way you would if you were nesting," says therapist Kathryn Smerling, Ph.D.
How long is too long in a sauna? Since there are profound effects on the body due to the high temperature, a whole host of factors come into play. Your heart is working faster (the pulse can jump to 30 percent or more, doubling how much blood it pumps per minute), you are sweating profusely (therefore becoming dehydrated), and blood pressure rises and falls. As with most good things, be sure to follow safety precautions and limit your time inside. Is it safe to sit in a sauna for an hour? One of the first things to consider is building up a tolerance to the heat. While the max amount of time you should spend in a sauna is approximately 30 to 45 minutes (lower for those with health issues such as high blood pressure), you should not aim for that on your first try. Build up a tolerance instead. Experts recommend starting with 10 to 15 minutes—making sure to rehydrate afterward—and then adding a little more time each session. Most places don't enforce time limits. There is no safety monitor standing in the sauna, ready to blow her whistle to tell you when your 30 minutes are up. Instead, time yourself and check the spa or gym for signs that specify how long to spend inside. Most importantly, listen to your body. While you might be aiming for a longer session, if you start to feel lightheaded, dizzy, or excessively overheated, step outside. Give yourself a break to let your body return to a normal temperature and then try again if you feel comfortable. Another plus to saunas is uninterrupted time to spend with a friend, so you might want to invite one to make the time more enjoyable. Saunas can be a healthy and relaxing way to spend time—just be sure it's less than an hour. You'll be feeling the benefits in no time. 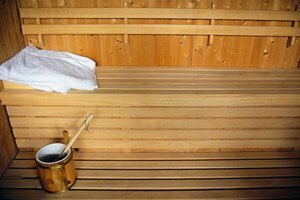 Harvard Health Publishing: Sauna Health Benefits: Are Saunas Healthy or Harmful?